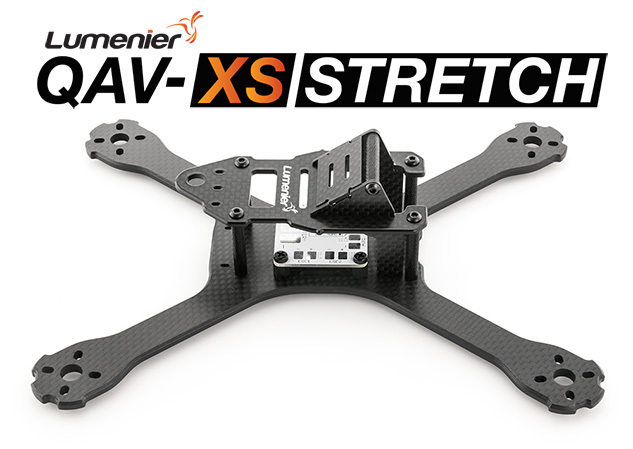 The Lumenier QAV-XS Stretch FPV Racing Quadcopter is a Stretch-X, light weight, super stiff, finely tuned airframe designed for high performance FPV Drone Racing. This racing airframe is stripped down to the bare essentials without sacrificing strength and durability. The Stretch-X has outstanding handling characteristics on pitch for a locked in, high speed forward flight, and quick snap rolls. This version features an ultra-durable 4mm carbon fiber main unibody plate. The main "unibody" 4mm plate is CNC milled out of a solid sheet of premium Lumenier carbon fiber. The outer weave of the carbon fiber runs in line down each arm of the QAV-XS (0/90 weave), maximizing the strength of the carbon and arms. The center layers are offset at 45 degrees providing even and balanced strength throughout the entire plate. The main plate and top plate have a chamfered edge on top and bottom giving it a nice finished look and removes any sharp edges. Each piece of carbon is cleaned and sprayed with a clear coat for a premium finish. There is no sanding required, and no messy carbon dust. Included with the QAV-XS Stretch kit is the popular Lumenier 4Power power distribution board which can be fitted with an optional Pololu voltage drop-down circuit (to 12v or 5v), a XT60 pig-tail. Like the QAV210/180, the QAV-XS kit enables mounting of small FPV cameras such as the Lumenier CM-650 in a fully encased assembly which protects the FPV camera during crashes and enables pointing the FPV camera at a wide variety of viewing angles. Stretch-X Compact size for 5" propellers, 222mm motor to motor. 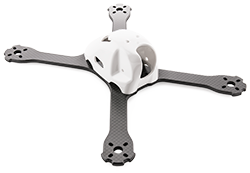 The QAV-XS Stretch airframe is compatible with the Lumenier Race Pod Cover. Replace the top plate and spacers with this aerodynamic racing pod for a sleek racer. Join the online discussion about the QAV-X / QAV-XS on popular forums like RCGroups and FPVlab.